Last week three African-American men, The New Day, set the record for the longest reigning WWE tag team champions. In route to their record setting victory, two more African-American superstars earned championship goal. Sasha Banks won the Raw Women’s Championship and Rich Swann won the WWE Cruiserweight Championship. This led to a post by the New Day’s Xavier Woods posting a picture with each superstar and using the hashtag black excellence. 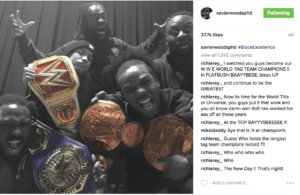 While there were mixed emotions towards this post, this also sparked a re-occurring conversation, when will there be an African-American WWE champion? In case people forgot, The Rock’s father Rocky Johnson was African-American, therefore there has been an African-American champion. About a year ago, I wrote an article of the top 15 guys who should have been champion. However, I will dispute some of the names that I listed. During the mid-2000s, Shelton Benjamin was arguably one of the best wrestlers on the WWE roster. He is a former tag team champion, Intercontinental Champion, and United States Champion, however he never won the big one. But why? Despite his sick spot in the Money in the Bank ladder match, what else could Benjamin offer. His lack of personality does not make him a candidate for the biggest prize in the sport. Could you really see Benjamin on The Today Show representing the company? I was a fan of R-Truth turning heel in 2011. John Cena was on top of the WWE, but it seemed that there was not any fresh opponents for him. Suddenly R-Truth showed a new side. He introduced the world to Little Jimmy and easily became the top heel in the company. Like Benjamin, Truth was no stranger to gold in the WWE; he was an NWA champion in the newly formed TNA. But why wasn’t heel R-Truth a WWE champion? It’s simple, he could not maintain being the number one heel in the company. A couple of weeks after losing his title match against Cena, CM Punk dropped the imfamous “pipebomb” and instantly became the top heel in the company. Many would say WWE missed the boat here, but if Truth couldn’t maintain being the top bad guy, then there was no reason to put the title on him. Kofi Kingston has been known for making highlight reels with highflying moves and his annual Royal Rumble spot, but why would fans claim he should wear the big belt? In 2009, he etched himself in Madison Square Garden history when he made a dive onto Randy Orton that shook the wrestling world. That was believed to be the moment that could take Kingston to the next level. However, it was soon forgotten and Kingston was back to the mid-card winning US, IC and Tag Team titles. Ahmed Johnson is the first African-American Intercontinental Champion. When he arrived to the WWE, he had that look that fans had not seen in a long time. Not only was he powerful, but he could fly as well. So why not Ahmed? For one, Shawn Michaels, the top guy at the time, told him to stop flying because it would not be as special when he did it. Johnson has said that killed his momentum. Ron Simmons also said that Johnson did not understand the give and take of the business. Last, Johnson could not speak clearly. Listening to him cut a promo was as painful as the moves he delivered.